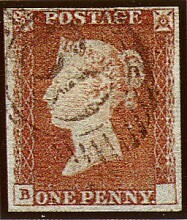 Certainly the most outstanding error of the 1d red imperfs is the ‘missing A’ variety on the stamp lettered BA from plate 77. The error was spotted about nine months after the plate had been registered and the missing ‘A’ was struck into position. At first the sheets with this error were held back by the Post Office, however they were finally released for sale to the public, the catalogue value is some £5750. Only a few are known but others must exist.